Sophocles (495 BC - 406 BC) was the second of three great ancient Greek tragedians. He was preceded by Aeschylus, and was followed by or contemporary to Euripides. According to the Suda, a tenth century AD encyclopedia, he wrote 123 or more plays during the course of his life. For almost 50 years, he was the dominant competitor in the dramatic competitions of ancient Athens that took place during the religious festivals of the Lenaea and the Dionysia. His first victory was in 468 BC, although scholars are no longer certain that this was the first time that he competed. Only seven of his tragedies have survived into modern times with their text completely known. The most famous of these are the three tragedies concerning Oedipus and Antigone: these are often known as the Theban plays or The Oedipus Cycle, although they were not originally written or performed as a single trilogy. Sophocles influenced the development of the drama, most importantly by adding a third character and thereby reducing the importance of the chorus in the presentation of the plot. He also developed his characters to a greater extent than earlier playwrights such as Aeschylus, and used female characters in his plays. Thereafter, Sophocles emerged victorious in dramatic competitions at 18 Dionysia and 6 Lenaia festivals. In addition to innovations in dramatic structure, Sophocles' work is also known for its deeper development of characters than earlier playwrights. His reputation was such that foreign rulers invited him to attend their courts, although unlike Aeschylus who died in Sicily, or Euripides who spent time in Macedon, Sophocles never accepted any of these invitations. Aristotle used Sophocles' Oedipus the King in his Poetics (c. 335 BC) as an example of the highest achievement in tragedy, which suggests the high esteem in which his work was held by later Greeks. Only two of the seven surviving plays can be dated securely: Philoctetes (409 BC) and Oedipus at Colonus (401 BC, staged after Sophocles' death by his grandson). Of the others, Electra shows stylistic similarities to these two plays, which suggests that it was probably written in the latter part of his career. Ajax, Antigone and The Trachiniae are generally thought to be among his early works, again based on stylistic elements, with Oedipus the King coming in Sophocles' middle period. Most of Sophocles' plays show an undercurrent of early fatalism and the beginnings of Socratic logic as a mainstay for the long tradition of Greek tragedy. The Theban plays consist of three plays: Oedipus the King (also called Oedipus Tyrannus or by its Latin title Oedipus Rex), Oedipus at Colonus and Antigone. All three plays concern the fate of Thebes during and after the reign of King Oedipus. They have often been published under a single cover. Sophocles, however, wrote the three plays for separate festival competitions, many years apart. Not only are the Theban plays not a true trilogy (three plays presented as a continuous narrative) but they are not even an intentional series and contain some inconsistencies among them. He also wrote other plays having to do with Thebes, such as the Epigoni, of which only fragments have survived. In Oedipus the King, Oedipus is the protagonist. Oedipus' infanticide is planned by his parents, Laius and Jocasta, to avert him fulfilling a prophecy; in truth, the servant entrusted with the infanticide passes the infant on through a series of intermediaries to a childless couple, who adopt him not knowing his history. Oedipus eventually learns of the Delphic Oracle's prophecy of him, that he would kill his father and marry his mother; Oedipus attempts to flee his fate without harming his parents (at this point, he does not know that he is adopted). Oedipus meets a man at a crossroads accompanied by servants; Oedipus and the man fought, and Oedipus killed the man. (This man was his father, Laius, not that anyone apart from the gods knew this at the time). He becomes the ruler of Thebes after solving the riddle of the sphinx and in the process, marries the widowed Queen, his mother Jocasta. Thus the stage is set for horror. When the truth comes out, following from another true but confusing prophecy from Delphi, Jocasta commits suicide, Oedipus blinds himself and leaves Thebes, and the children are left to sort out the consequences themselves (which provides the grounds for the later parts of the cycle of plays). The plays were written across thirty-six years of Sophocles' career and were not composed in chronological order, but instead were written in the order Antigone, Oedipus the King, and Oedipus at Colonus. Nor were they composed as a trilogy - a group of plays to be performed together, but are the remaining parts of three different groups of plays. 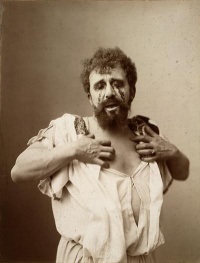 As a result, there are some inconsistencies: notably, Creon is the undisputed king at the end of Oedipus the King and, in consultation with Apollo, single-handedly makes the decision to expel Oedipus from Thebes. Creon is also instructed to look after Oedipus' daughters Antigone and Ismene at the end of Oedipus the King. By contrast, in the other plays there is some struggle with Oedipus' sons Eteocles and Polynices in regard to the succession. In Oedipus at Colonus, Sophocles attempts to work these inconsistencies into a coherent whole: Ismene explains that, in light of their tainted family lineage, her brothers were at first willing to cede the throne to Creon. Nevertheless, they eventually decided to take charge of the monarchy, with each brother disputing the other's right to succeed. In addition to being in a clearly more powerful position in Oedipus at Colonus, Eteocles and Polynices are also culpable: they consent <l. 429, Theodorides, tr.> to their father's going to exile, which is one of his bitterest charges against them. In addition to the three Theban plays, there are four surviving plays by Sophocles: Ajax, The Women of Trachis, Electra, and Philoctetes, the last of which won first prize. "After practising to the full the bigness of Aeschylus, then the painful ingenuity of my own invention, now in the third stage I am changing to the kind of diction which is most expressive of character and best." Here Sophocles says that he has completed a stage of Aeschylus' work, meaning that he went through a phase of imitating Aeschylus' style but is finished with that. Sophocles' opinion of Aeschylus was mixed. He certainly respected him enough to imitate his work early on in his career, but he had reservations about Aeschylus' style, and thus did not keep his imitation up. Sophocles' first stage, in which he imitated Aeschylus, is marked by "Aeschylean pomp in the language". (Bowra) Sophocles' second stage was entirely his own. He introduced new ways of evoking feeling out of an audience, like in his Ajax when he is mocked by Athene, then the stage is emptied so that he may commit suicide alone. Sophocles mentions a third stage, distinct from the other two, in his discussion of his development. The third stage pays more heed to diction. His characters spoke in a way that was more natural to them and more expressive of their individual character feelings. Unless indicated otherwise, the text in this article is either based on Wikipedia article "Sophocles" or another language Wikipedia page thereof used under the terms of the GNU Free Documentation License; or on original research by Jahsonic and friends. See Art and Popular Culture's copyright notice. This page was last modified 07:32, 23 February 2014.